Isherwood was a great admirer of Lowry, and wheadled his way into his company at every opportunity. He was heartened in the mid 1960s when Lowry purchased one of his paintings – Minnie Small with Black cat. He hung it in his studio and it remained there until the great artist died. Lowry bought many paintings to encourage young artists but there is no photographic evidence that these were ever hung at his home, The Elms, in Mottram-in-Longdendale. Great art is demonstrated by Isherwood in this portrait of Lowry which is magnificent, capturing the quiet calm and gentle nature of the man. The Wigan artist painted a number of portraits of Lowry. This is, without doubt, one of his best. One similar is owned by The Lowry Arts Centre. In this Isherwood portrait, Lowry is wearing his trade-mark mac, white shirt and black tie. This major painting shows Isherwood at his very best. 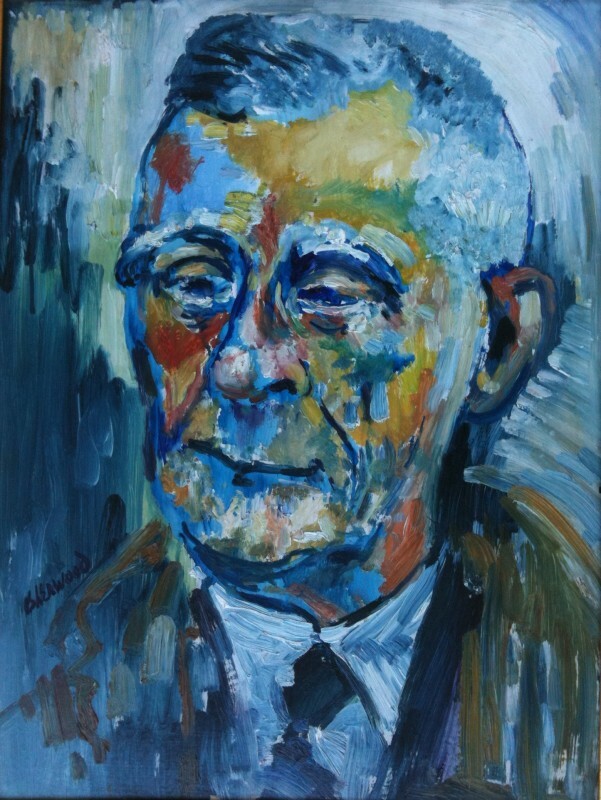 He has perfectly captured Lowry in contemplative mood in later life.